Whether an incident takes place on the job or after hours, everyone bears some risk of becoming incapacitated, unable to work, and in need of assistance from short-term disability insurance coverage. This coverage provides financial support to replace lost income while you take time off to recuperate at home. While becoming injured or ill does happen at home and other places, a surprising number of disabling incidents happen in the workplace in any given year, creating a substantial need for disability insurance coverage. An annual report released by the union organization AFL-CIO has reported its findings on the safety of the American workplace. Called Death on the Job: The Toll of Neglect, the report advises that each day approximately 150 workers die on the job, and some 7.4 million to 11.1 million worker injuries take place each year, often going unreported. According to the Council for Disability Awareness, around one-quarter of today's 20-year olds have a chance of becoming disabled at some point in their career before retirement. Some people's disabilities will require more support than the amount provided by short-term disability insurance. On average, long-term disability incidents last about 34.6 months, meaning almost three years of lost work and foregone income. 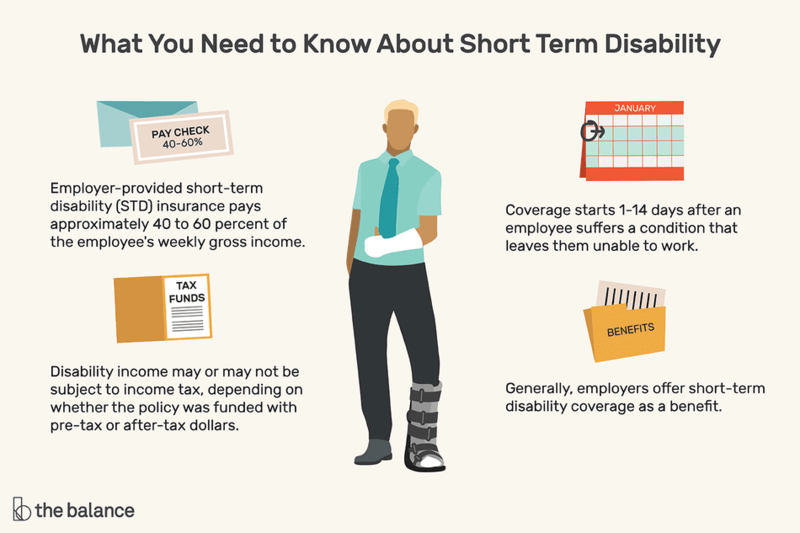 Employer-provided short-term disability (STD) insurance pays a percentage of an employee’s salary for a specified amount of time, if they fall ill or get injured, and cannot perform the duties of their job. Generally, the benefit pays approximately 40 to 60 percent of the employee's weekly gross income. Independently-purchased short-term liability insurance works relatively the same, offering a range of partial to full income coverage, depending on the policy level and premium you choose to pay. Disability income may or may not be subject to income tax, depending on whether the policy was funded with pre-tax or after-tax dollars, among other considerations. Coverage usually starts anywhere from one to 14 days after an employee suffers a condition that leaves them unable to work. The time of coverage may vary from 9 to 52 weeks from eligibility. Many times, employees are required to use sick days before short-term disability kicks in if it’s an illness that keeps them out of work for an extended period of time. Employers often have other types of insurance that cover workplace injuries, such as workers compensation, with different rules and requirements, versus disability insurance for those injuries that occur off the job. If an employee must be out of work for longer than the short-term disability benefit coverage period, then either a long-term disability plan or permanent disability kicks in. This may happen at 10 to 53 weeks from the date of eligibility. Determination for long-term disability is provided by the insurance company's team of doctors and insurance analysts who carefully monitor each case. Who Pays for Short-Term Disability Coverage? A short-term disability policy can be an employer- or employee-paid benefit. Generally, though, employers offer short-term disability coverage as a benefit. Contract agreement through an insurer that covers disability. As an employer, you can create a policy dictating that employees use sick days before going on short-term disability for an extended illness. You can also require documentation from a doctor to prove an illness or injury. During the time that an employee misses work, the employer may also request that the employee visit an approved medical provider or an occupational medicine center for regular updates on the progress of the employee's health. A third-party claims administrator will be in charge of managing these aspects while the employee takes time out of work. Employees must report any changes in their status immediately. These rules are in place to help prevent insurance fraud, a problem that costs employers billions of dollars annually. Employees need to work for the employer for a certain amount of time before coverage kicks in. Employees need to work full-time, usually 30 hours or more a week. Percentage of weekly salary paid out (typically between 40 percent to 60 percent of weekly salary). Duration of short-term disability benefits (typically between nine to 52 weeks). It’s also important to know the rules of the states in which employees reside. While most states do not have a mandated short-term disability requirement, The Society for Human Resource Management advises that five states including California, Hawaii, New Jersey, New York, Rhode Island, and the US territory of Puerto Rico do have mandatory coverage guidelines. Employers may want to also consider offering a voluntary benefit option for a long-term disability program that takes over once an employee’s short-term disability ends. What's the Difference Between Short-term Disability and Temporary Disability? What Private Unemployment Insurance Is Available? What Are EAP Benefits and How Do They Help Employees? You've got Employee Benefit Questions - We've Got Answers!